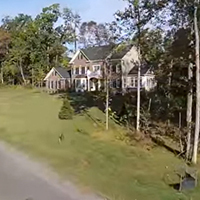 HAMILTON, VA — At our award-winning Waterford Creek community just North of Leesburg, we’re constantly referring to the “spectacular 3-acre wooded homesites” in our newest section and the overall setting with its “private entry drive and cul-de-sacs”. What we haven’t been able to convey, until now is the visual that truly and realistically captures this setting. Nor have we been able to show you (as most builders can’t or don’t) what’s beyond those trees surrounding your home, here. Now, with the help of an aerial view, you can see Waterford Creek for yourself, and it is quite a site – magnificent three-car garage residences with up to 6600 square feet of finished living space. To our knowledge some of the area’s largest homes, and certainly some of the most beautiful homesites. Take a look from above and come see our very down-to-earth values at Waterford Creek.